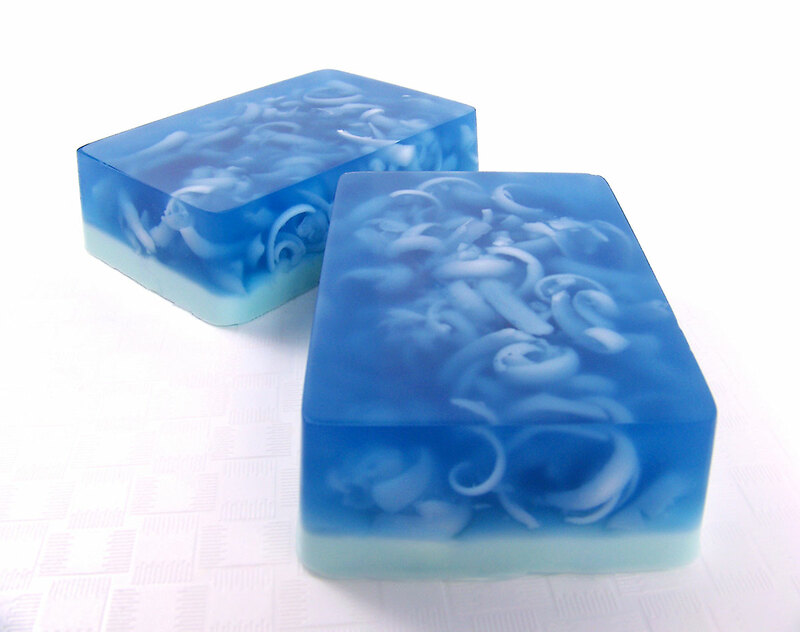 Lovely blue and white soap effect using a dark over pour over white soap embeds. This tutorial creates a lovely soap with a beautiful effect and can be used with a variety of scents and colors. Enjoy! 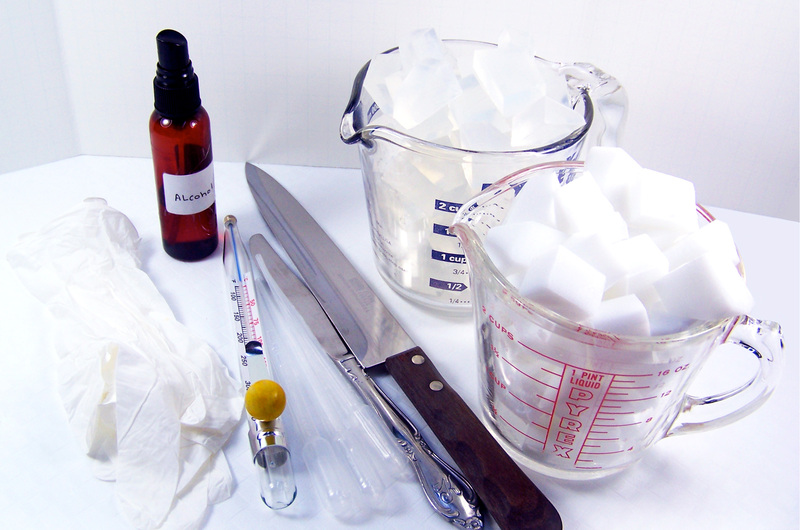 This tutorial makes 4, 4 ounce bars of soap. You can increase/decrease as desired to make more/fewer bars. Grate 2 oz of the White Melt and Pour Soap base and set aside. Cut up 10 oz. 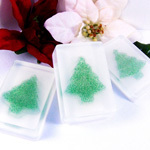 of Ultra Clear Melt and Pour soap into small cubes. Place in a microwave safe glass container and melt in the microwave using 30 second bursts, stir between bursts until melted. 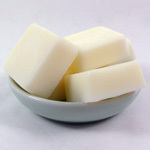 For added moisturizer, add 1 tsp of Sweet Almond Oil to the melted soap. Stir thoroughly. 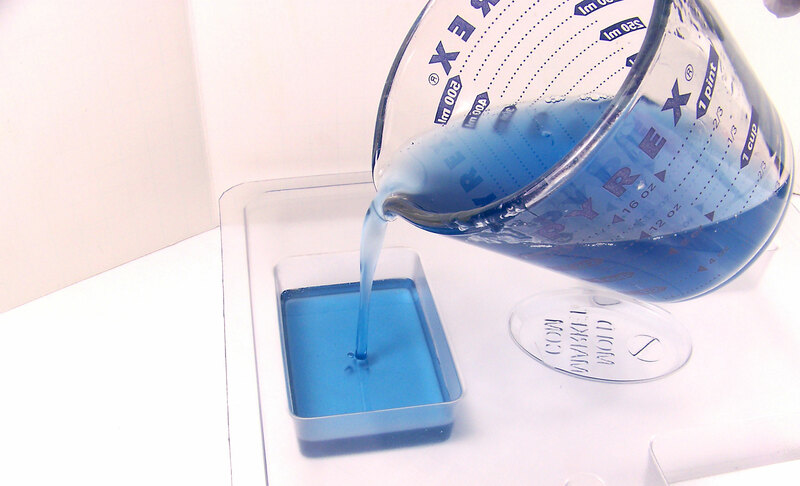 Add 8 drops of the Royal Blue Gel Soap Colorant and slowly stir. 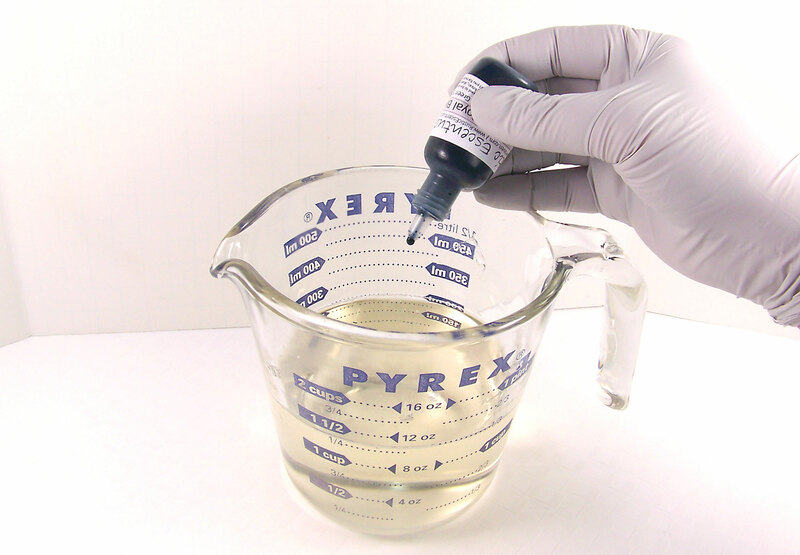 Using a disposable pipette, add 3 ml’s of Orchid Rain fragrance oil. Stir slowly until mixed well. 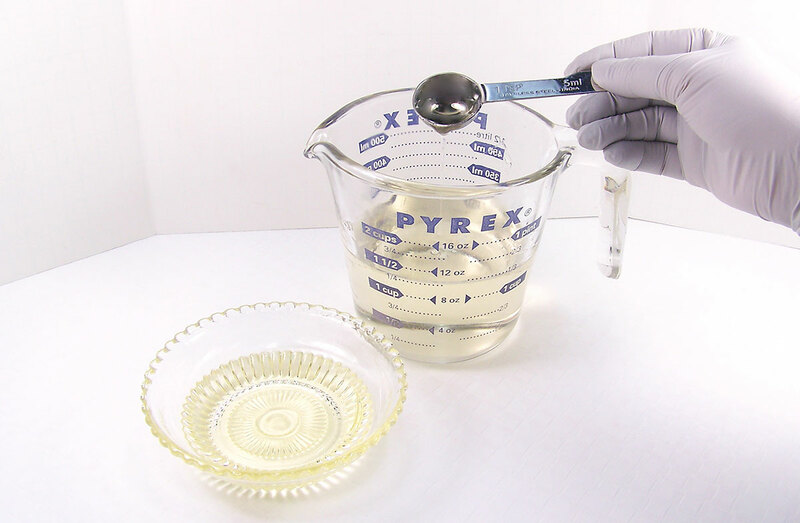 Use a thermometer to monitor the soap base temperature; it should be approximately 135° to avoid warping the mold and melting the embeds. If soap is too hot, keep stirring slowly. 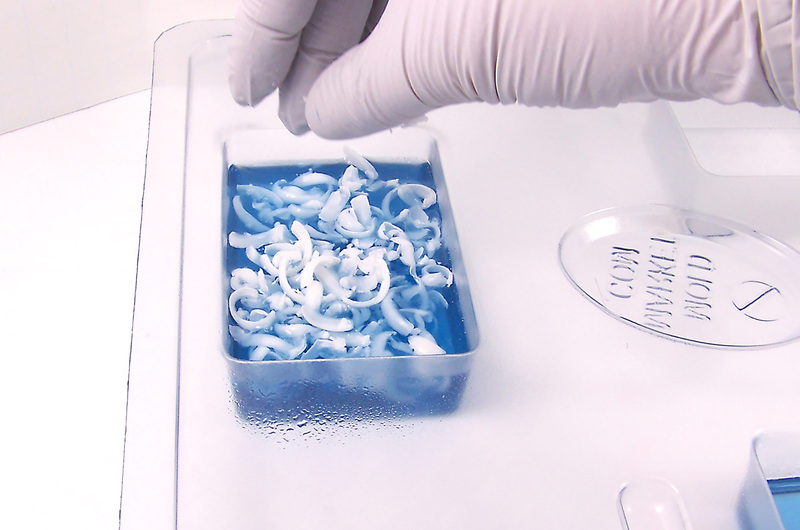 Slowly pour 2.5 oz of the blue melted soap into each cavity. Pour slowly to avoid excess bubbles. Spritz the soap to remove any bubbles. 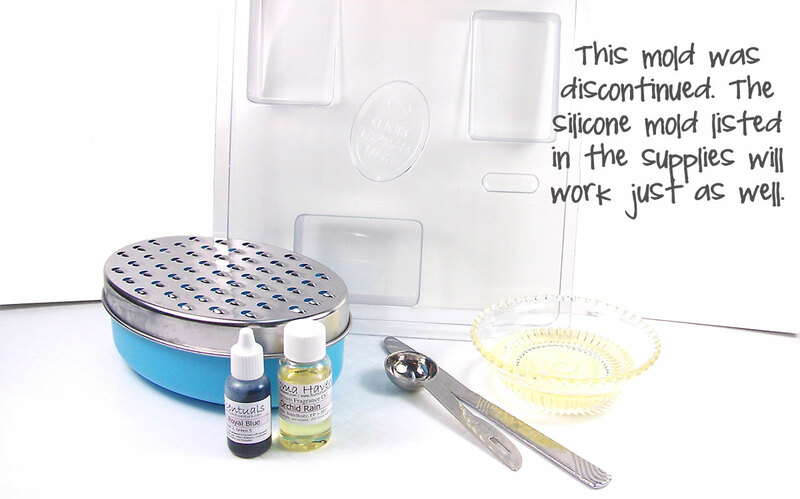 Important: Do not pour to the top of the mold – it is important to leave enough room for the final layer. 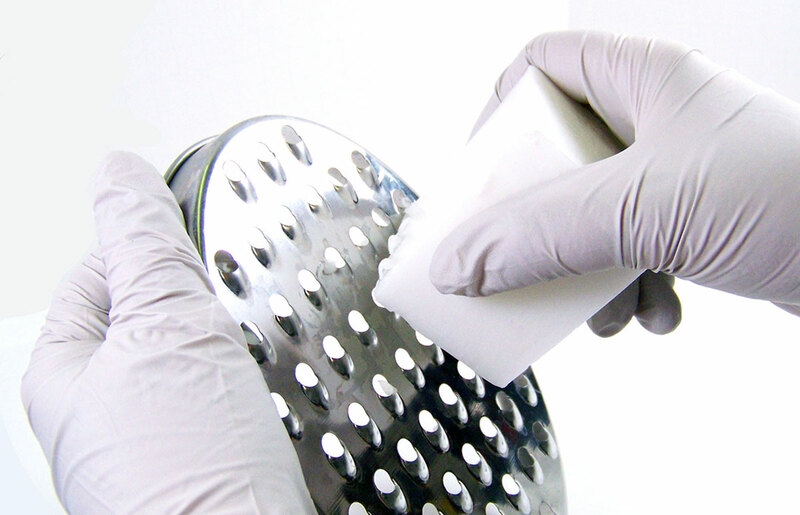 Spritz the soap shreds with alcohol and add evenly among all 3 cavities. It may be necessary to press them into the soap. Follow up with a spritz of alcohol. 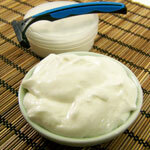 Let set for approximately 10 minutes or until the layer is firm enough to support the second layer. 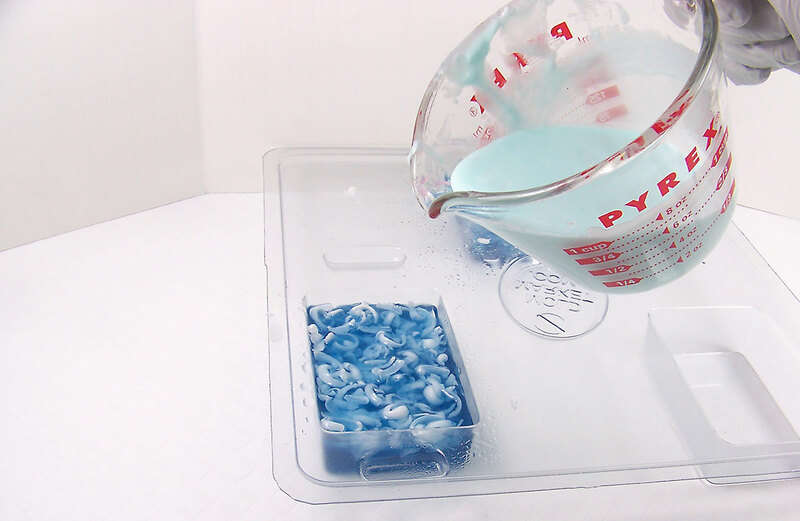 Take the cubed white melt & pour soap base (4 ounces) and place in a microwave safe glass container. Melt in the microwave in 15-second bursts until melted. 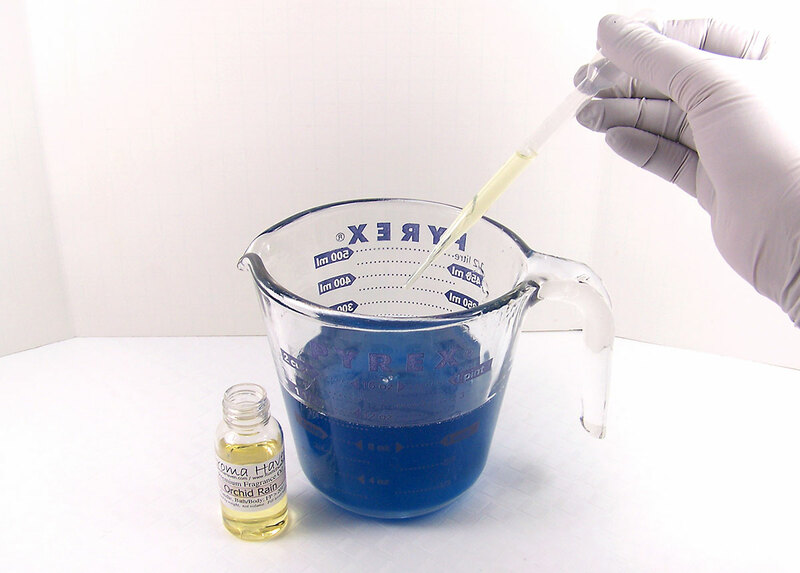 Add two drops of Royal blue colorant and 1.5 ml of Fragrance Oil. Stir until everything is fully incorporated. 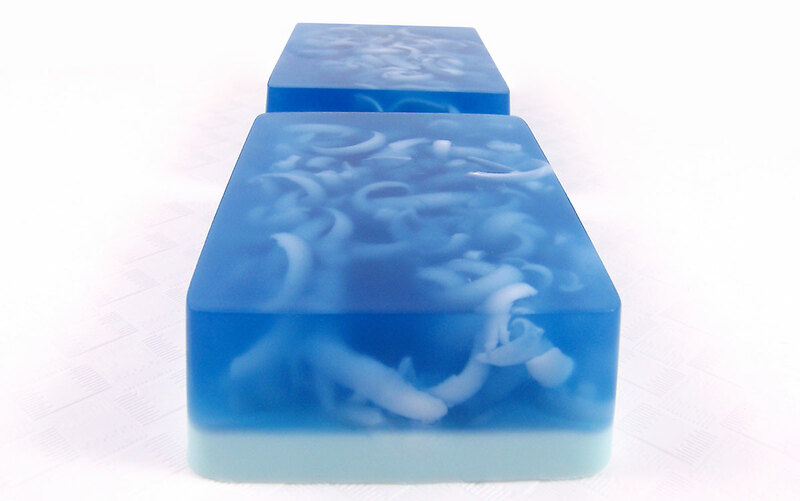 Spritz the soap in the mold with alcohol and slowly pour the melted soap to the top of the mold. 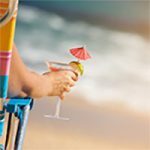 Spritz with alcohol to remove any bubbles. After the soap has completely set (approximately 2-3 hours), turn the mold over and slowly press on the bottom of each cavity to release the soap. Do not force it. If the soap won’t come out, wait another 1/2 hour or so. Pop the soap in the freezer for 5 minutes then try again.